Yellow Starthistle is a winter annual plant that can range from 10 inches to over 6 feet in height depending on growing conditions. Fall-germinated seeds quickly develop in deep-rooted rosettes of bright green, deeply lobed leaves shaped like an arrowhead. They grow from 6 to 8 inches long and 1 to 2 inches wide. Plants produce single or multiple branches that have matted hairs giving the plant a gray-green color. The stem leaves are small and linear with smooth edges and sharply pointed tips. The leaf blades extend down the stem giving it a “winged” appearance. A single, bright yellow flowerhead armed with 1-inch stiff thorns is produced on the end of each branch. Both plumed and unplumed brown seeds are produced in each flowerhead. Grazing Objective: Graze heavily at least twice each year to prevent flowering and for several years to deplete seedbank and reduce plant density. Growth Stage for Treatment: Sheep and goats will graze yellow starthistle in all growth stages. Cattle will graze in the rosette to bolting stage but will avoid the weed beyond the late bud stage. Two or three treatments are needed if grazed in the rosette or bolting stage; grazing during or after flowering with goats may require only one treatment per year. Potential Effectiveness: Targeted grazing to control yellow starthistle is strongly recommended for sheep and goats, less so for cattle. Goats are probably the most effective livestock to use for grazing of yellow starthistle because they will readily eat the plant in all growth stages. Grazing reduces plant vigor and plant size and suppresses flower production. Effective control depends on the prevention of flower and seed production, which can be achieved by grazing at least twice a year over several years. 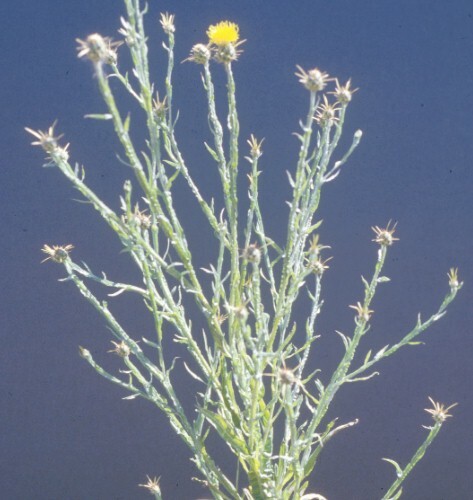 Yellow starthistle is highly toxic to horses. Exotic Pest Plant Council. 2006. Yellow starthistle management with grazing, mowing, and competitive plantings. California, UC Davis. Available at: http://ucce.ucdavis.edu/freeform/ceppc/documents/1996_Symposium_Proceedings1824.pdf. Accessed 12 July 2006. Olson, B.E. 1999. Grazing and weeds. In: R.L Sheley, and J.K. Petroff [EDS.]. Biology and management of noxious rangeland weeds. Corvallis, OR: Oregon State University Press, p. 85-96. Popay, I., and R. Field. 1996. Grazing animals as weed control agents. Weed Technology 10:207-231. Thomsen, C.D., W.A. Williams, M.R. George, W.B. McHenry, F.L. Bell, and R.S. Knight. 1989. Managing yellow starthistle on rangeland. California Agriculture 43:4-6. Thomsen, C.D., W.A. Williams, M. Vayssieres, F.L. Bell, and N.M.R. George. 1993. Controlled grazing on annual grasslands decreases yellow starthistle. California Agriculture 47:36-40. Thomsen, C.D., W.A. Williams, W. Olkowski, and D.W. Pratt. 1996. Grazing, mowing and clover plantings control yellow starthistle. IPM Practitioner 18:1-4.